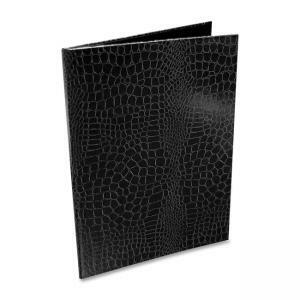 Portrait Format Padfolio is made especially for use with portrait format writing pads, sold separately. Made with sturdy recycled paperboard that has a high-gloss, scratch-resistant, simulated crocodile leather surface. Includes an archival safe polypropylene inside pocket for loose papers. Earth-friendly padfolio contains post-consumer recycled material and is made with no volatile organic compounds, so being green has never been so easy or looked so good.